Over the three days of the 2013 BAFS, there were 43 presentations, eight Live and Pre-Recorded Case Presentations, and two 2-hour-long panel discussions. The following are my brief summaries of 16 presentations. 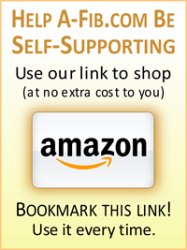 For my longer articles, see Steve’s In-depth Reports. Another notable innovation was Dr. Vivek Reddy’s pre-recorded case presentation on “renal denervation.” It was fascinating to watch as Dr. Reddy threaded a catheter up and across arteries to ablate nerves leading to the kidneys. See “Live Satellite and Pre-Recorded Case Presentations” below. The next day Dr. Reddy gave a talk on Renal Denervation. As many as 30% of people with high blood pressure have uncontrollable hypertension where meds, lifestyle changes, better diet, etc. have no effect. And hypertension accounts for around 1/2 of all A-Fib cases. Renal Denervation (applying RF pulses to the nerves in the vascular wall of the arteries leading to the kidneys) both lowers uncontrolled high blood pressure and reduces A-Fib. The “Difficult Cases in AF Management” session produced an insightful, hotly discussed case which the author repeats nearly in its entirety. 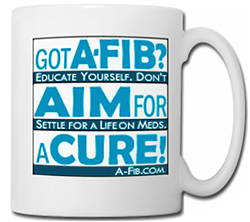 A young athlete of 14 developed A-Fib. 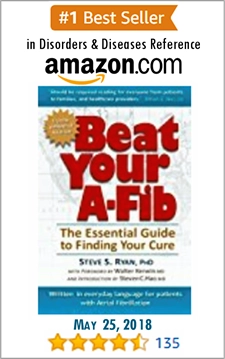 How does one treat A-Fib in someone so young (the youngest the author has ever heard of)? Opinions were definitely mixed. See “Difficult Cases in AF Management” below. The satellite and pre-recorded case presentations were wonderful, sometimes jaw-dropping, and worth the price of admission by themselves. Dr. Moussa Mansour demonstrated live how to insert a Lariat II noose-like device over the Left Atrial Appendage (LAA) using a balloon inside the heart to expand the LAA. He then used catheters with magnets inserted from both outside the heart and inside the heart to guide the Lariat II noose over the LAA and tighten it, thereby closing off the LAA and eliminating most threats of an A-Fib stroke.See “Live Satellite and Pre-Recorded Case Presentations” below. Speaking of the LAA, Dr. Dhanunjaya Lakkireddy described how the LAA can have very different shapes and structure. The shape of one’s LAA may have something to do with the risk of A-Fib stroke. 48% of A-Fib patients have a “Chicken Wing” structure which has less risk of stroke. The other shapes “Cactus”, “Windsock”, and “Cauliflower” carry more risk of stroke. In another pre-recorded case Dr. Andrea Natale worked on the most difficult case A-Fib doctors usually encounter—an older man in persistent A-Fib and with significant scarring (fibrosis). One technique he showed was ablating around the Left Atrial Appendage which he said was often the key to a successful ablation. In the pre-corded case presentations, Dr. Francis Marchlinski demonstrated the use of “Jet Ventilation” during an ablation. Jet Ventilation slows down the heart so that it’s easier to make an ablation. Dr. Jeremy Ruskin gave a historical perspective on how amazingly fast catheter ablation (Pulmonary Vein Isolation, PVI) has been accepted and gone into widespread use as therapy to make patients A-Fib free. Back in 2001 PVI was barely an afterthought in medical guidelines, while today it’s recognized as first line therapy. 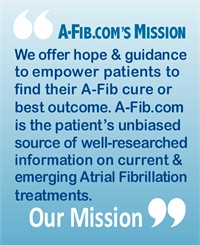 See “Amazing Evolution of Catheter Ablation Guidelines” below. Dr. Douglas Packer in another pre-recorded case demonstrated the use of the new CryoBalloon catheter with eight jets rather than four to produce better freezing. Dr. Hans Kottkamp presented data from his center and others which he said indicated that A-Fib doesn’t always produce fibrosis. But the second speaker after him, Dr. Jose Jalife, showed an experimental study using sheep hearts where inducing A-Fib clearly increased or was associated with an increase in fibrosis. Even the experts don’t always agree. The author has to admit that the scientific sessions on Thursday morning aren’t always the easiest to follow. But Dr. Jalife’s experiments seemed very well designed and conclusive. Dr. David Wilber, in a pre-recorded case, showed how he ablated someone who had failed both an ablation and a Thorascopic Maze operation. He primarily used low voltage electrograms. Dr. Sanjiv Narayan, inventor of the FIRM mapping and ablation system, gave one of the most controversial presentations entitled “Is PV Isolation Necessary for Successful Ablation of PAF (Paroxysmal A-Fib Ablation).” If there is one constant among the thousands of EPs doing catheter ablation for A-Fib, nearly all start with ablating the Pulmonary Vein openings (PVs). No one seemed to accept Dr. Narayan’s position. It was like throwing raw meat to a pack of hungry lions (I’m exaggerating here). In the following discussion everyone piled on poor Dr. Narayan. He himself admitted in the discussion session that when he didn’t isolate the PVs, they were still firing A-Fib signals into the heart, though these signals seemed to decrease over time. For a further discussion of the FIRM system, see my 2012 article: ‘FIRM’ (Focal Impulse and Rotor Modulation) for Catheter Ablation of A-Fib by Dr. Narayan of UC San Diego (will open in new browser window). Dr. Judith Davis offered attendees a new perspective as a Veterinarian who can help researchers design studies involving animals. Dr. Davis recommended animal studies have at least 4-6 animals. She pointed out some of the important anatomical differences in animals that researchers need to be aware of when designing experiments. For example, dogs and pigs are protected from having strokes because they have different intracranial artery structures and extra artery branches than humans. In the session on Advances in Catheter Ablation for Paroxysmal A-Fib, Dr. Pierre Jais gave a talk and a pre-recorded case presentation on a promising new Circular and Mapping Ablation Catheter being developed by Biosense Webster (the nMARQ circular and crescent irrigated catheters with Multichannel RF generator and Carto 3 3D mapping system). Previous circular catheters were non-irrigated and seemed to cause more TIAs and strokes. This adjustable catheter seemed to produce circular lesions relatively easily and effectively. According to Dr. Jais it’s better, faster and easier than standard RF point-to-point ablation. It takes him only 12 minutes to isolate all four Pulmonary Veins. The whole Ablation procedure takes less than an hour. The number of EPs performing CryoBalloon ablations is increasing rapidly, even though Medtronics requires they receive special training first. Over 35,000 CryoBalloon ablations have been performed worldwide at over 400 centers. Of the presenters at this year’s Symposium, Dr. David Wilber of Loyola Un. Medical Center, Chicago co-authored with Dr, Audrius Bredikis a book on Cryo “Cryoablation of Cardiac Arrhythmias” (2011 Saunders/Elsevier hardback $134). Dr. Douglas Packer of the Mayo Clinic in Minnesota gave a pre-recorded case presentation on the new CryoBalloon ablation catheter. The “Even Cool” system, with eight freezing jets instead of four, provides better control and a more even freezing surface. The balloon when cooled actually attaches itself to the moving heart tissue (like if you stuck your tongue on a frozen flagpole), which makes for a more controlled, secure contact . But unlike RF, a cryo contact if misplaced can be allowed to unfreeze and then be moved without any damage to the previously cooled tissue. Whereas in RF ablation, when you make an ablation, it’s permanent. Cryo ablation generates less blood clots than RF ablation and is generally safer for patients. In Dr. Packer’s demo it seemed much faster and easier to make circular CryoBalloon lesions than RF point-by-point ablation. Cryo seemed to cause what I would call a better type of heart tissue damage than RF. After a CryoBalloon ablation, heart tissue seemed whitened but normal. Heart tissue integrity didn’t seem compromised or weakened. Whereas RF ablation is like burning your arm. There is a permanent scar, ugly-looking dead, fibrotic tissue, etc. But CryoBalloon ablation is relatively new. We don’t have much long-term data. However, it’s encouraging and a testimony to its effectiveness to see so many EPs who previously did RF ablation turning to CryoBalloon ablation. Dr. Douglas Packer from the Mayo Clinic, in a presentation on the Risks of A-Fib Ablation, discussed stenosis (a narrowing of blood vessels after A-Fib ablation)—a complication considered to be increasingly uncommon as ablation techniques have improved over the years. 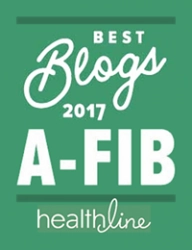 But Mayo, as a nationally recognized A-Fib center, is often sent cases with “exotic” complications. Stenosis is seen more often than one would expect. Dr. Packer stressed that A-Fib doctors need to be vigilant and should check ablated patients for stenosis after three months. (It usually takes six months for a severe case of stenosis to completely close a vein.) 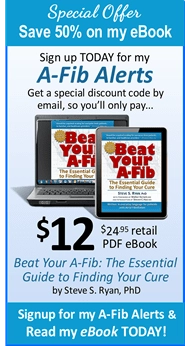 But only around 25% of A-Fib doctors really look for stenosis. If a patient has any significant pulmonary problems, from bronchitis to coughing up blood, complains of shortness of breath, develops pneumonia, etc., suspect stenosis unless proven otherwise. If caught early, angioplasty balloons and stents can often correct for stenosis. But these patients need to be re-checked probably for life, because re-stenosis can occur. Cases of stiff left atrium, presumably because of excessive scarring of the left atrium. MRI studies have revealed Cerebral Micro Embolic events, but they don’t always cause symptoms and often disappear over time. But they are certainly something everyone wants to avoid causing. Phrenic Nerve injury during CryoBalloon ablation usually goes away over time and is less of a problem with experience. (Added 3/6/13) Dr. Packer also mentioned “late tamponade” (an accumulation of fluid in the pericardial sac around the heart) probably due to oozing from an ablation or catheter site that recurs when patients are started back on anticoagulants.